← Topiary Sunday for Flower Show Competition Monday! 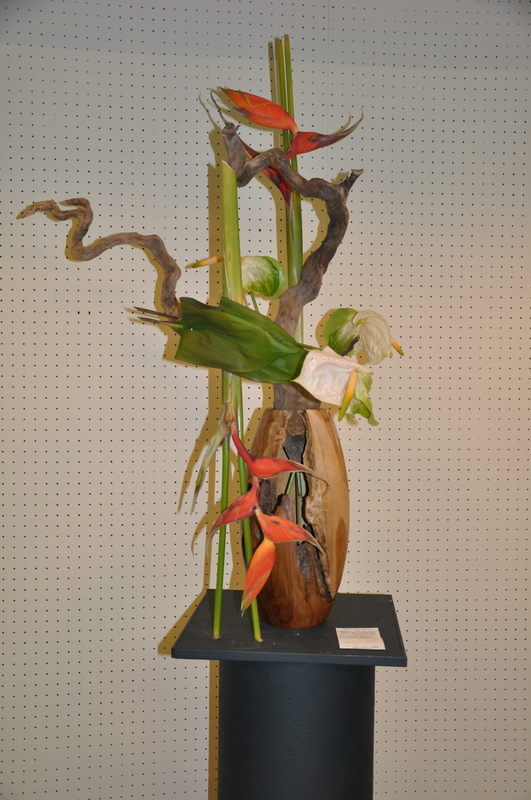 February Garden Club Flower Show: The Blue Ribbon Designs! 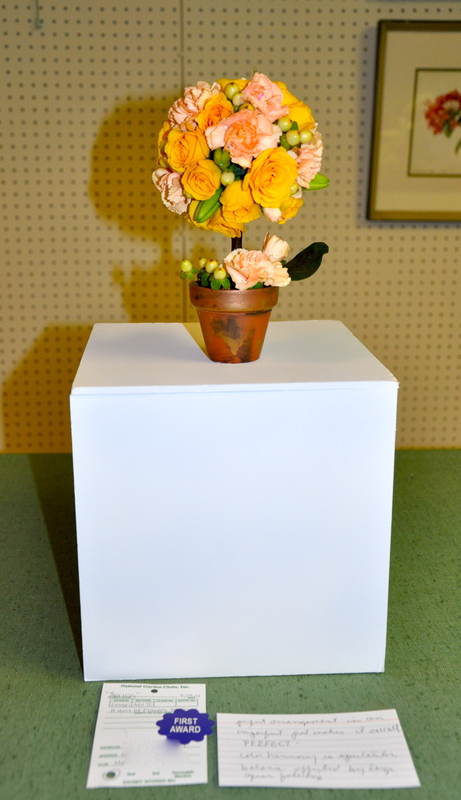 Yesterday I showed you how I created a “Small Design” topiary that I entered in my garden club’s February flower show. As an Advanced II designer I was awarded a blue ribbon for my topiary; the judges loved the juxtaposition of the “perfect arrangement in an imperfect pot.” That made me happy! 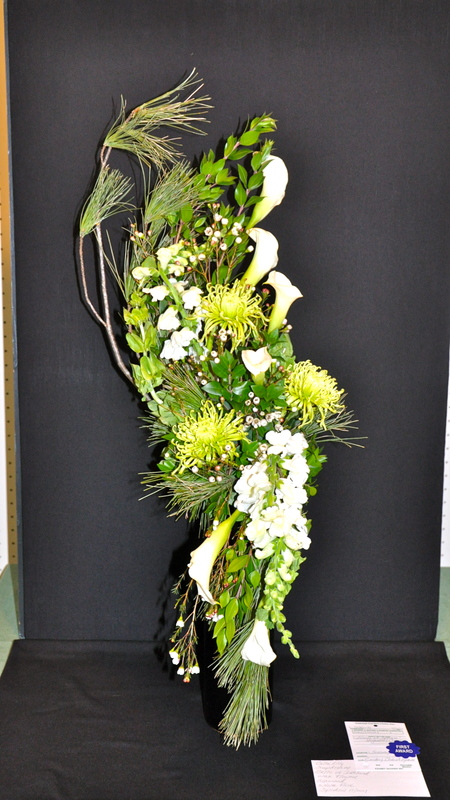 My small design is a floral topiary. 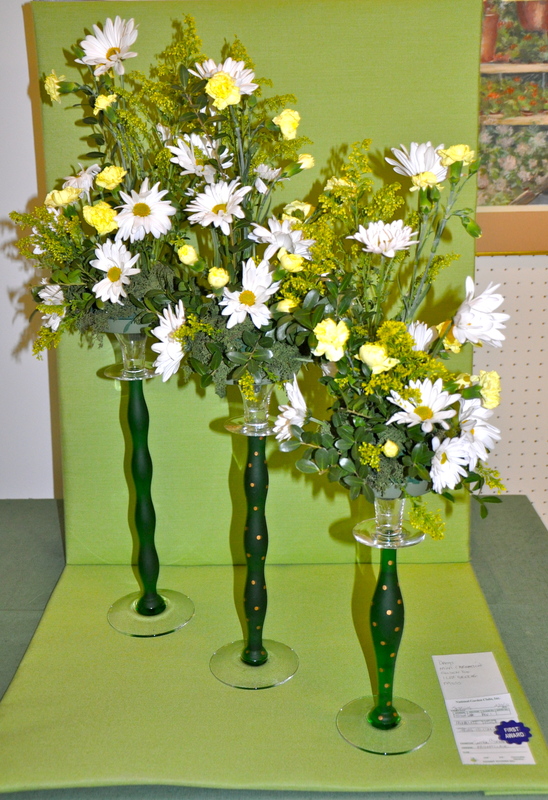 My friend Cynthia is a truly gifted designer; I showed you one of her “creative” designs in December (Garden Club Flower Show Results: Surprising!). Cynthia is an Advanced I designer, and yesterday, her ”Parallel Design, staged on a table 30” from floor; allotted space 24” deep x 24” wide. Background and underlay optional” was awarded a blue ribbon. Cynthia’s design is a stunning example of a parallel design! I always learn something from studying Cynthia’s designs. See how the three elements are closely related to create the parallel design? Susan, another friend, is a Novice designer and her “Traditional S-Curve Design, staged in front of a backboard panel 36” high x 24” wide provided by committee, staged on a table 30” from floor” was simply beautiful; she was awarded a well-deserved blue ribbon for her white and green design. Susan's S-Curve design is a good example. Each month our garden club has a flower show, a gifted designer is invited to showcase a design style of her choice. This month’s “Invitational” designer showcased a unique “Creative Design.” I aspire to this level of skill and imagination! This "Creative Design" is contemporary, complex and clever!